There is a decision making method based on wrapping problems into a Descartes square by answering 4 questions. 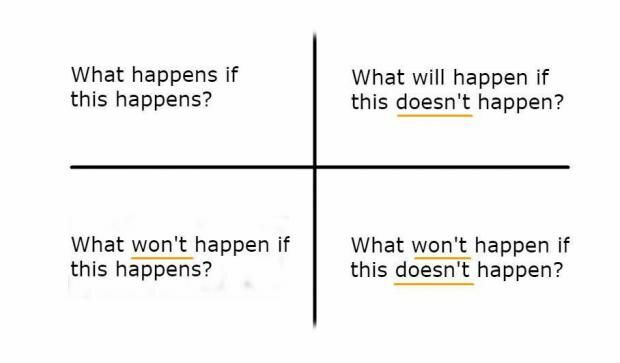 I've tried to use it for my own decision process but I couldn't figure out what to place into the "What won't happen if this doesn't happen?" section. For me it sounds just like the negation of "What happens if this happens? ", thus the same items in a negated form are in there. Is it supposed to help me in my process? What happens if this happens ? What happens if person X falls from a 26th floor window on to the pavement ? X dies or is injured. What won't happen if this happens ? What won't happen if person X falls from a 26th floor window on to the pavement ? X won't walk away. What will happen if this doesn't happen ? What will happens if person X doesn't fall from a 26th floor window on to the pavement ? X will attend a meeting in 15 minutes' time. What won't happen if this doesn't happen ? What won't happen if person X doesn't fall from a 26th floor window on to the pavement ? The answer is not necessarily a negation of 1. since X might still die or be injured (in some other way). I don't know if it's possible to use examples in which the answer to 4. is a negation of the answer to 1. But I can't see that there's any necessary negation between them. Not the answer you're looking for? Browse other questions tagged logic argumentation process or ask your own question. A strange generalization of the square of opposition? are these statements valid argument? Why are sentences expressing one's opinion statements?